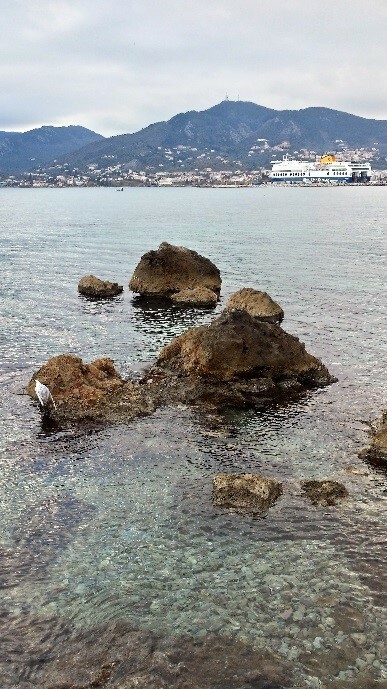 The first boat I saw arriving was a challenge for me, being the overemotional person that I am. Somehow I managed to overcome my feelings, distance myself from the situation and help in any way I could. 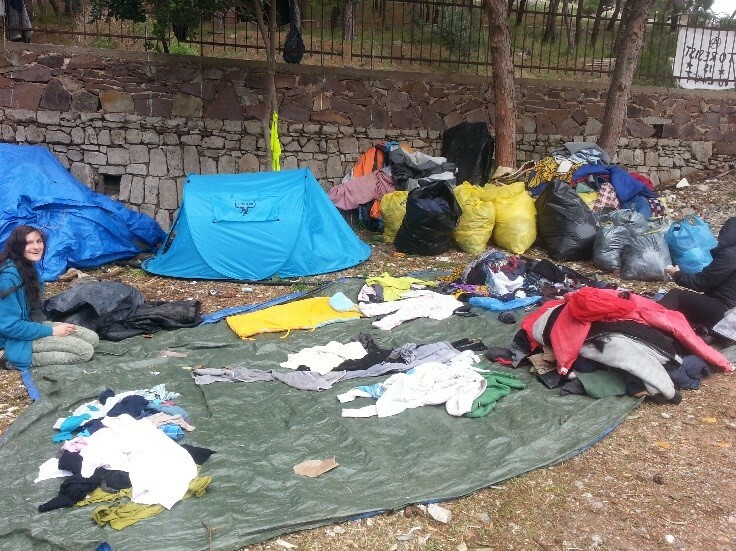 As soon as I arrive at the camp in the morning, Jacopo tells me, ‘Grab as much clothes as you can, a boat just arrived on a beach nearby’. We then get in the car and he drives skilfully like the good Italian driver that he is. 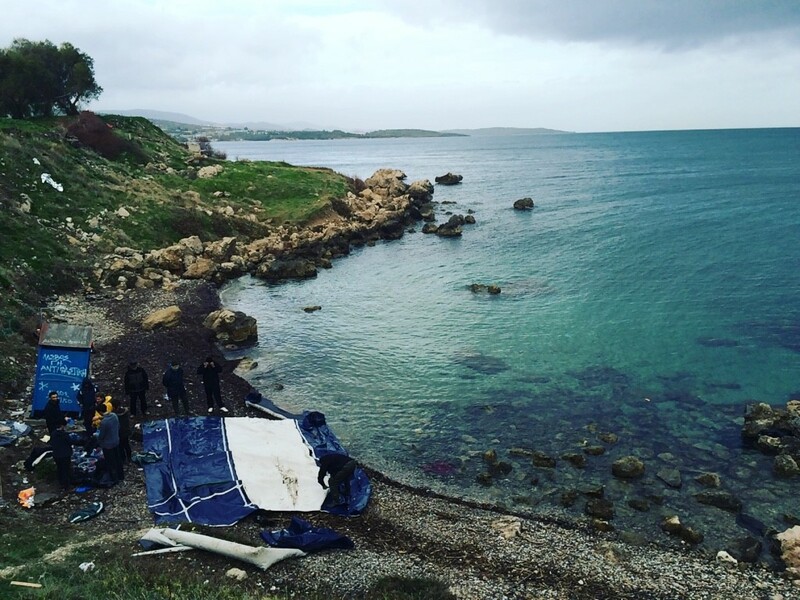 The first thing to do as a boat arrives is to get everyone changed into dry clothes and get wrapped in foil blankets to avoid pneumonia. The boat trip normally takes between 4 to 6 hours; this means you can get soaked in the cold water and you are prone to getting pneumonia. 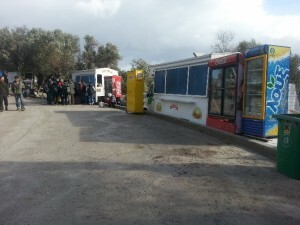 We then give food and help people to move to the bus that will take them to the main UNHCR registering camp – Moria. After the bus left we got together with some locals and started organizing clothing and separating it between dirty and wet. Our other allies – the hot Spanish Bomberos from Proem Aid http://proemaid.org/ – were dismantling the boat after they had rescued everyone in it. The Bomberos were a group of water-specialized rescuers who came all the way from Spain to help. Their intentions were as good as their looks. I learnt later that these well intentioned young men had been arrested under the claim of human trafficking, by the Greek coast guard, as they were rescuing people from a boat at sea that was sinking. They stayed in prison for a week and even after losing most of their funds to pay for the bail, they remain active on the island. 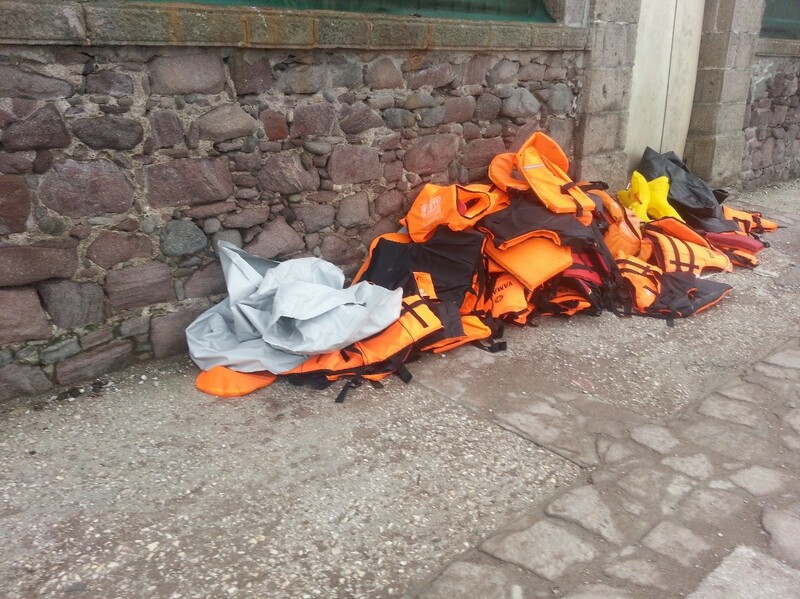 Many of the life vests are fake. They do not prevent drowning thus immediate action is needed, especially in cases where children are involved as they cannot swim. Following the arrival of the boat, Silvia, Jeremy, Chiara, Jacopo, Rik, Julie, Justine and I went for a trip around the island to visit other camps. The UNHCR camps had a clear separation between volunteers and refugees, barbed wire and fences all around the camps. 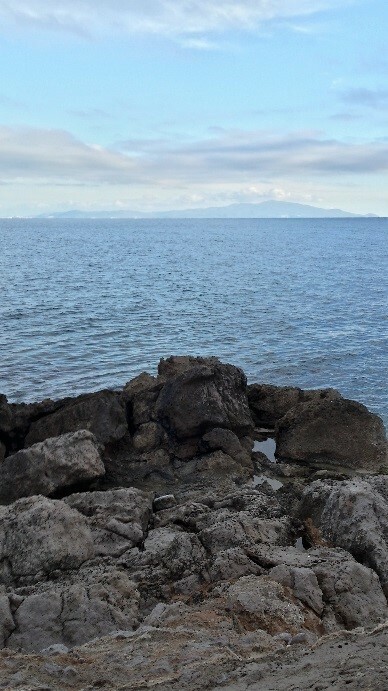 Although people seemed to be helpful, there was still a sense of coldness that was not found in camps such as the lighthouse where colour and warm materials like timber took over and the only barriers one can see is that of the sea horizon and the beautiful vines. 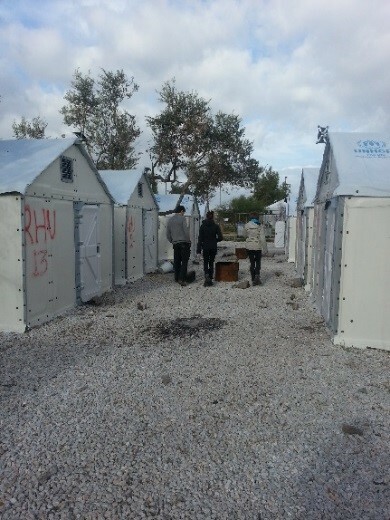 The prefabricated Ikea houses and the barbed wire made the UNHCR camps look like a concentration camp whilst the lighthouse camp reminded me of a scene from a children’s book. The free market was starting to take over as you could see vending machines and stands right in front of the UNHCR camps selling food and goods to the refugees. Gypsies were also benefiting and making good money out of the whole situation, since they were infiltrating camps in order to get food and clothes as well as selling things. 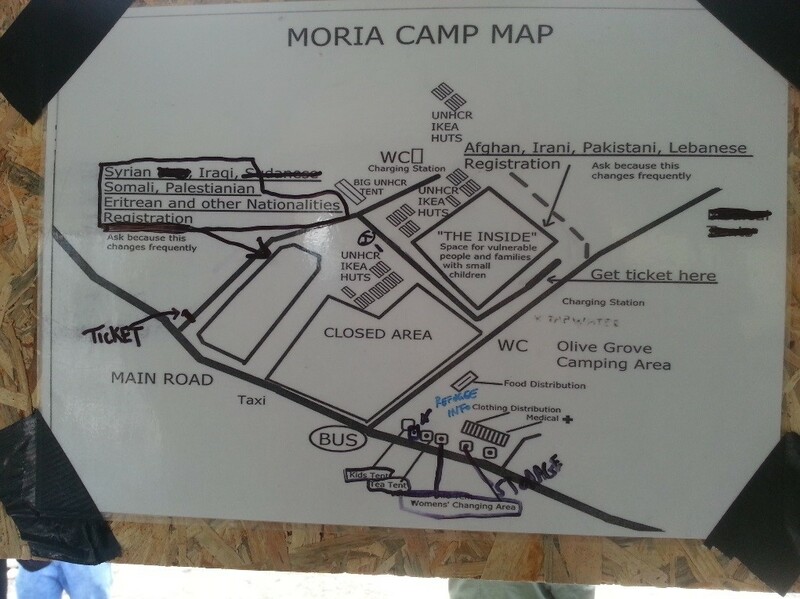 When we got to Moria we were even more shocked. 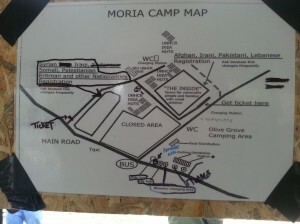 Moria used to be a military base that has now turnedinto the main refugee registration camp on the island. 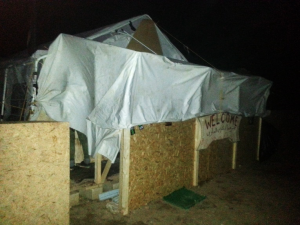 Thanks to the work of the individual volunteers the camp had been modestly transformed with a sense of warmth, with some paintings here and there. 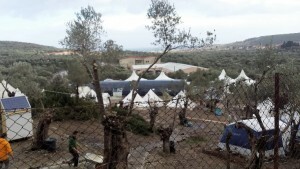 What was incredible to see was the tents for the already-registered refugees. On average, the waiting time for registration was about 4 days. 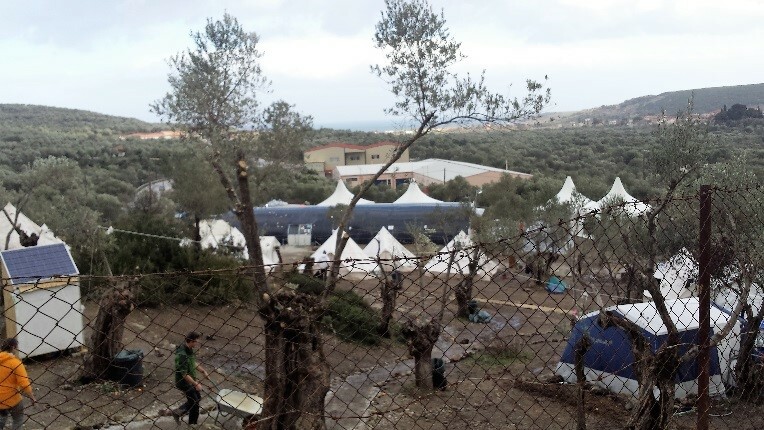 Once registered, you have to leave the camp to get yourself a ticket to go to mainland Europe on the ferry. Where would you stay between registering and getting a ticket? 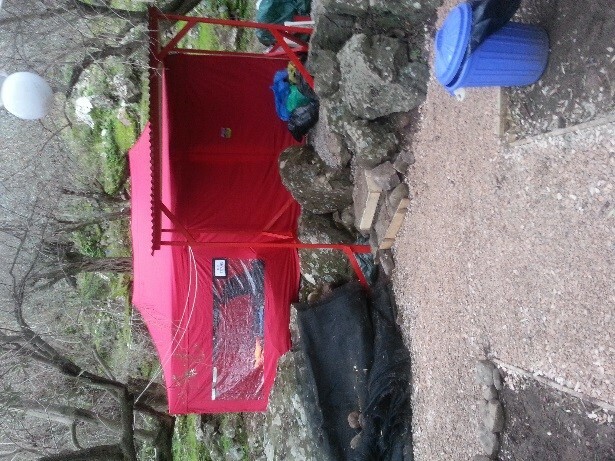 In the tents next to the camp in the middle of a muddy vineyard or in other camps and squatted places if you were not lucky enough to find a generous Greek family to take you in or to have enough money to get a place to stay at a hostel. 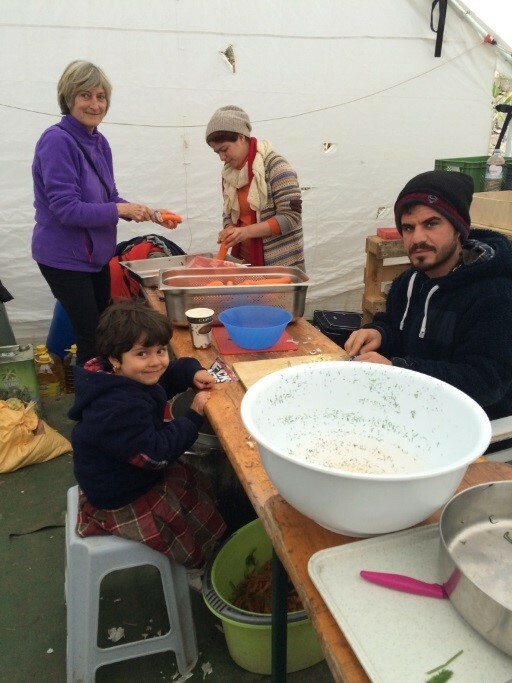 We enjoyed the best tea ever from the British group called Wild Lemon Team operating in the muddy field next to the tents, and talk to some of the volunteers working at Moria. 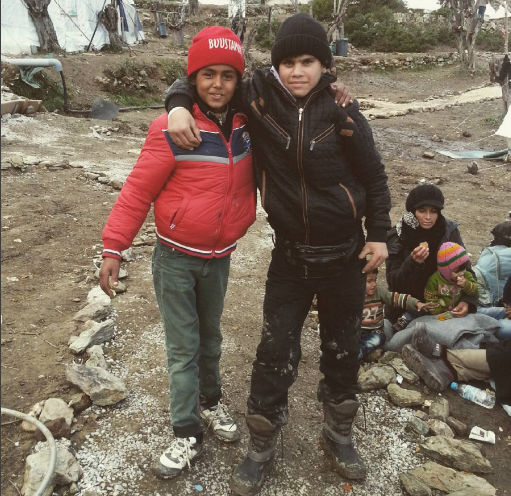 I met little Abdul and his friend who saw me taking pictures and insisted I recorded their friendship. They were about 9 years old and were just wondering around the camp alone. 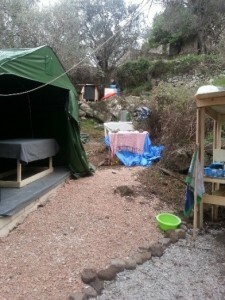 I then asked one of the volunteers what happens to minors arriving alone at the Island to which she replies, ‘They normally stay in a special camp for minors for 3 weeks until something is sort out for them, but I never report them as I believe that the minors’ camp is awful and they are much happier staying here’. One other thing we noticed was that there was a special allocation of people depending on their nationality, the reason for this is still unclear to me. When talking to Dr. Heather Johnson and photographer Iva Zimova about the issues behind the system for registration they both mentioned one very important thing – the system is too complicated for a newcomer to understand, and adding to this, there is a big language and communication barrier. Iva told me about a 16 year old whose uncle lives in the UK. 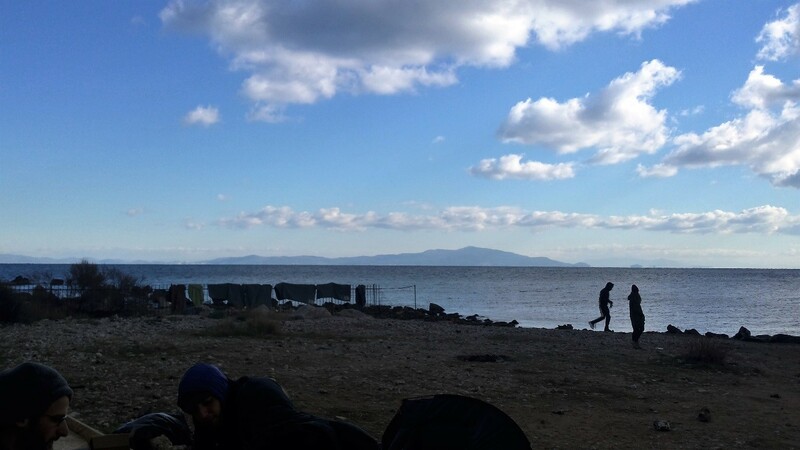 His uncle had offered to pay for everything, his trip and his schooling but because he got denied asylum, he had to do the crossing illegally through the boats. The main aim for now is to privilege war and political refugees seeking asylum, yet a lot of new comers seek better economic and political standards. People as young as me or even younger get sent over through the financial support of their families for it is their family’s belief that this is the best option for their sons and daughters to get a better life. When the EU tightens policies for migration and registration this causes people choose illegal methods such as fake papers to get into Europe. Why are people being forced to have to make such decisions? Very often if they are not able to get registered and eventually get deported, they get arrested and put into prison back in their country of origin as the country of origin has to pay for the deportation. No borders is a rather radical view on the whole issue but open borders is a different matter. Yes, there are borders and indeed we all belong somewhere, at some point, but given the circumstances and according to the basic human rights everyone has the right to seek asylum, no matter where they are from. On another note, The scepticism of some citizens of Europe towards newcomers, in my opinion, is as a result of the fear of loss of identity and tradition as well as economic possibilities. Economically Europe would benefit from these hardworking people coming to produce and consume our goods and services. Like Nick Hanauer explains on his banned TED talk, “consumers create jobs, not the less taxed super rich”. Refugees and migrants are consumers; they do not steal jobs, and they promote the creation of jobs. Also the wave of refugees now arriving on the shores of Europe are those who have the money to pay for the 4000 euros per person for a boat trip. In terms of cultural loss what people do not realise is that cultural change and transformation has happened infinitely amount of times before. Take the Portuguese: there were the Celtics and the Iberians which merged into the Celt Iberians, later came the moors and to this day we have words deriving from Arabic such as Oxala (deriving from Inshallah) which literally translating means ‘hope to God’ (in Arabic) and ‘hope for something to happen’ (in Portuguese). There is indeed a cultural clash going on but we must not show hostility towards each other and both sides must compromise in order for this to be a temporary or permanent (who knows) pacific progression of culture. A New comer will most certainly have to accept and practice the values we have for so long established in the West, the values of freedom so many of us take for granted. We also mustn’t assume freedom comes in a superficial form of cultural habits and what they integrate. Freedom relies on having the possibility to choose. In a case like this, one needs more empathy than sympathy. When moving into Germany, I realised Germans do not kiss on the cheeks when meeting someone new, and I thus learnt to shake hands instead. This does not mean I am not allowed to do this with those of same cultural background as me. Like Gerda Taro and Robert Capa (war photographers from the 20th century), people continue to risk their lives to bring the truth to the surface. However, sadly media still spreads the fear and too many of us are foolish to let them do so. The attacks in Cologne, for instance, were used as a catalyst for the right wing to promote anti-refugee attitudes although only 3 out of the 54 attackers were refugees. 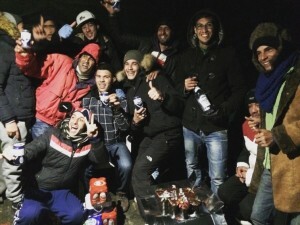 My family lives in Bonn and I often go to Cologne for parties, the sort of behaviour that happened during New Year’s was already familiar to me. During Carnival fests, about 5 years ago, also in Cologne by the Hauptbahnhof and Cathedral, we had been approached and assaulted by various Caucasian German and English speaking men. This is not a race-related problem, for race doesn’t actually exist, it is a made up concept that is used to separate and stigmatize. Sadly, due to the fact that so many people believe in race, one has to consider intersectionality when it comes to such issues. As architects we have to put ourselves in someone else’s shoes and consider their background in order to produce something for them, yet at the same time we have to deal with our egos and persona. This is, for me, the most important thing one can learn from Architecture in practice and it is a lesson that can and should be applied outside practice. 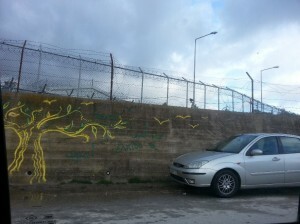 Once I got to Lesvos, Silvia tells me, ‘Everyone is taking a break today’. There had been a storm the previous night, which had destroyed the tents and soaked everything. Everyone’s mood was down, so we decided to down a couple of Ouzu shots – the best alcohol to go with Chamomile tea and honey as I found out later that night. Seeing all your work getting destroyed was not easy but getting there on such day made it possible for me to get to know everyone. I got to talk with Dervla, this cool motivational Irish lady which gave me great advice. Silvia, the star of the falafel group, and I got some sober drinks and talked, the mood was starting to go up. 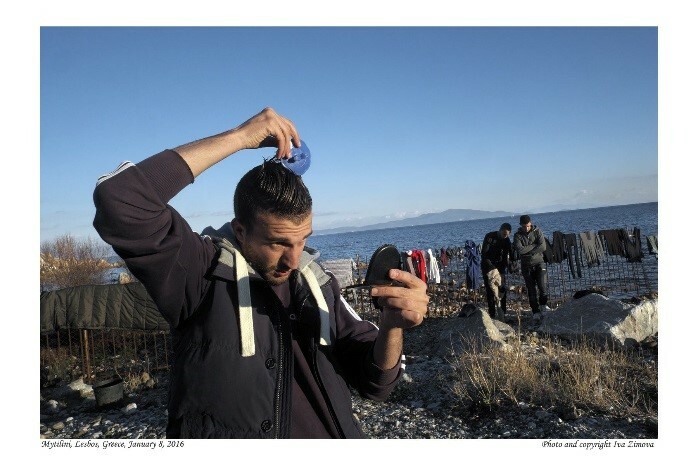 I got some very good advice from Andreas our Greek man on how to help when the boats arrive. I then met Dani, a 30 year old cool metal head Syrian newcomer who is also a tattoo artist as well as a volunteer in Lesvos. Soon enough I started making connections and sharing experiences. The same situation was being lived differently by different people. We were sharing moments and having fun while going through chaos. Although it did not become evident to me at first, a lot of the people were involved politically which is crucial but I came to realise that this ‘stand’, if not done pragmatically, can collide or even work against the humanization and the solidarity that is so needed given the circumstances. Leo had sign me in for the Lunch Shift. 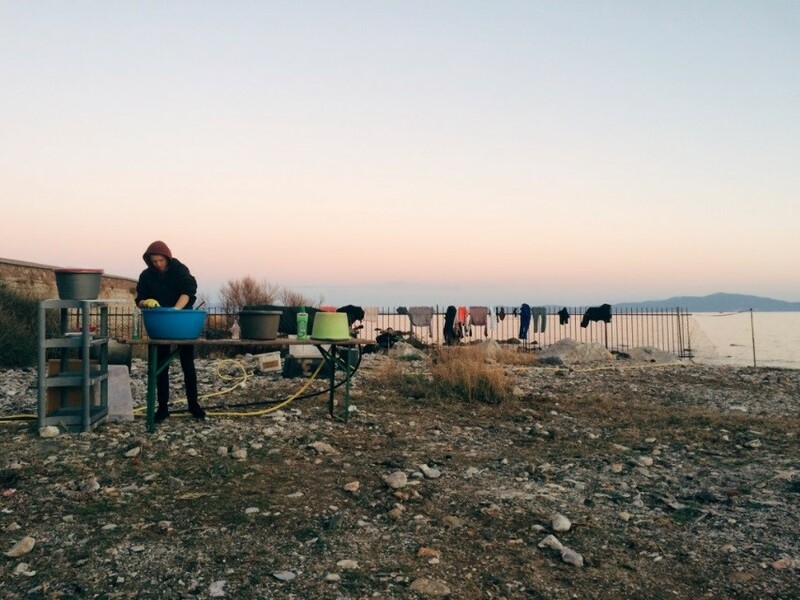 I did a bit of everything: cooking, sorting out clothes and just get to know people. I had the chance to put my French to test. 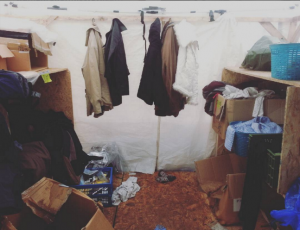 The clothing tent was extraordinarily difficult to manage; we had to sort out clothes and separate wet from dry from dirty as well as men’s from women’s from children. Socks had to be pinned together into groups of 3 pairs. Omaira, Ella and I spent the day sorting these out into bags to be sent to the ‘Dirty Girls’. The Dirty Girls are a group of women which gather most clothing from the camps, wash it, dry it and send it back to the warehouse which will then be distributed to all the camps across the island on list of demands made by each camp. 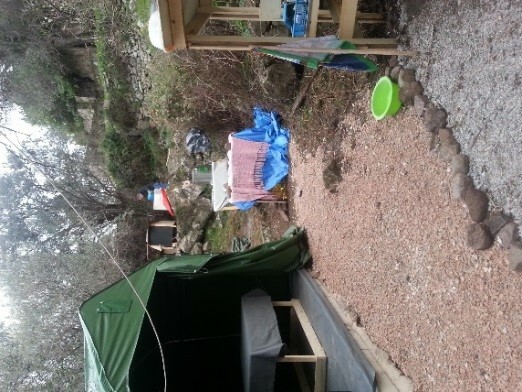 Camps would cooperate with each other alot of generous donations came from locals. However chaotic the situation was … somehow things seemed to be working out. After a while I started making all the shifts for the Clothing tent. 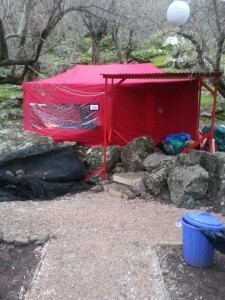 A major issue was the fact that the tent had been damaged from the storm thus clothes had gotten wet. On top of this, we had stray dogs coming in and out leaving that wonderful dog smell on the clothes and blankets. I took on the task of sorting things out, fixing the tent and put the clothes on the top shelves for limited and practically impossible canine access. 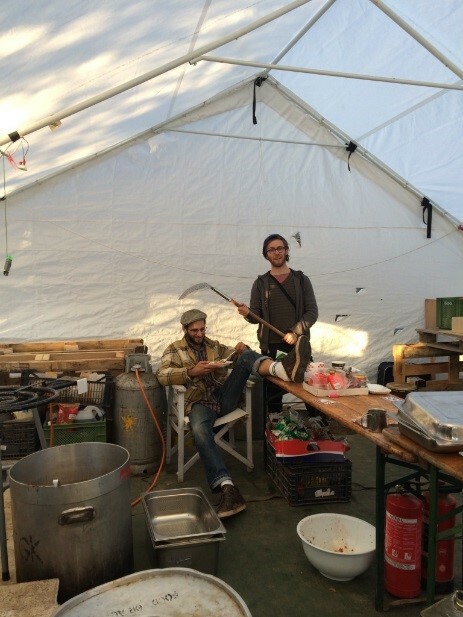 Soon, I had my two habibis, Mohamed and Mohamed Saeed helping me out in the tent. As the camp, at the time, was mostly made up of sassy young men with a great sense of fashion they were the most appropriate to help. Mohamed and Mohamed Saeed were Algerian, both with beautiful brown eyes always down to help out and make jokes amongst us with broken French, Arabic and English. Malik joined us a couple of times and he was so tired one day Ella found him sleeping like a baby in the blanket tent. Chiara joined us later on and she was by far the greatest contributor to this task, always motivated and focused. Meanwhile in the kitchen Silvia, Jeremy, Riki and Lulu kept busy making vegan food and distributing it. Leo and Louis kept fixing bits and pieces of the structure they had started to build in the previous weeks. 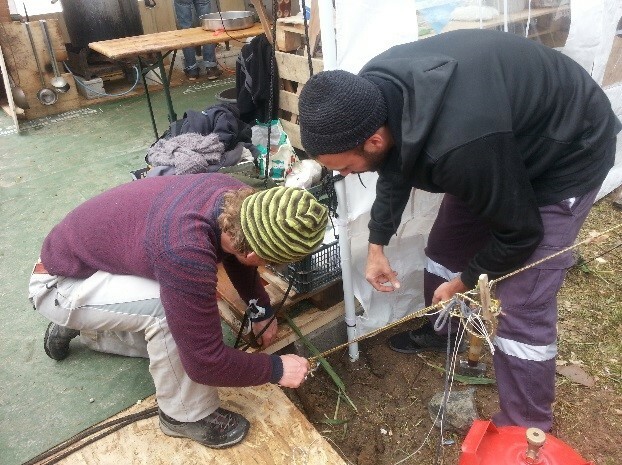 Together with the help of Riki and Jacopo they started expanding and reinforcing the existing structures by using some reclaimed wooden pallets and covers recycled from the rafts and from some donations of the UNHCR. At this point Pierre was developing his project in the Greek man’s workshop. 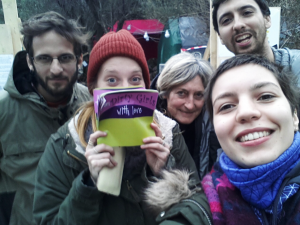 The collaborative spirit between volunteers and newcomers was a great thing to be part of. All these men and women put their muscles and brains to good use and helped Leo and Louis building the front reinforced cover for the kitchen. Men have just as many collaborative and multitasking skills as women do. 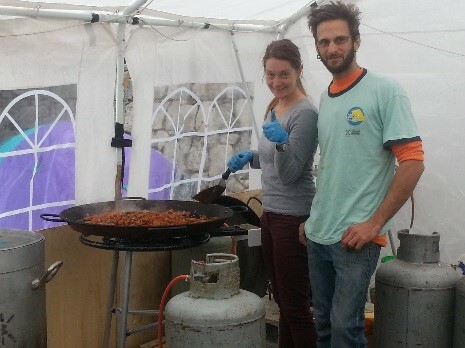 I got to meet the most awesome male feminists and they took over the role of helping in the kitchen, cooking delicious things for everyone and making great contributions towards the construction of infrastructure. I was told I reminded someone of their mother, I could see how much he must have missed her. I got some speakers and we got a party going and interestingly enough I found out that I wasn’t the only one to obsess over Kuduro from Angola, which was so refreshing since no one around here seems to know what it was. Everyone gathered in front of the kitchen listening to some Arabic or Portuguese lyric music, it was great. At some point the music stopped and someone had taken the portable charging device from the speakers. Surely they will give it much more use than I ever would! The collaboration in the building and management of the spaces was crucial in order to engage in conversation with the refugees instead of distancing volunteers from refugees. The political engagement of some of the volunteers we partnered up with was, for me, too extreme and not useful. Having had to spend hours and hours in meetings where my voice was ignored was frustrating as I would much rather be outside looking at the stars and dancing with the rest of the people. Our over politicized meetings sounded to the people outside like a ‘football match between Barcelona and Real Madrid’ – a quote from Malik’s friend. Although the camp was managed throughout the day with the collaboration of everyone, for some reason only on one occasion did we have one of the newcomers present, the most linguistically intelligent young men I have met – Abdul. Abdul spoke Spanish, Arabic, Italian, French and English and he was a peace maker trying to help everyone, he translated so much for us! His voice and that of some of the other newcomers had not been heard during the meeting which infuriated me. It seemed to me that some people we had partnered up with had good intentions yet their blindness led them to make wrong decisions. Decisions that contradicted their own beliefs of freedom and of kindness, and obviously put everyone else at risk. When the next storm was brewing Abdul said to me, ‘As long as we have dry clothes and blankets to change to in the morning we will be fine.’ This seemed reasonable to me, yet some people decided to take some of the migrants, who had not get registered, to a ‘safer place’ – the hospital. One of the nurses had to inform the police and let’s just say that had they not had their hands full at the time they could have gotten those people into big trouble. Some guy also said, ‘Why would I go to the hospital and sit if I can lay down here?’ Indeed why would you sit inside a building that stinks of death when you can lay down outside looking at the stars and at the views. It seems to me that some volunteers were only interested on being the ‘good guy’. Being a rebel, an activist and a volunteer has become trendy and ‘cool’. Going along and accepting all rules can be damaging, yet rebelling against them for the purpose of being a rebel can be even worse, and in all honesty, stupid. The original definition of ‘Hero’ in ancient Greece, and for Brazilians, is that of someone who has the great ability to get themselves into a lot of trouble and get out of it in the most possible ‘badass’ way, that is pragmatically and ‘in the moment’. The two examples of real Heroes I know of is Ulysses (Greek) and Macunaima (Brazilian) and yes those young men (refugees) are the one and only real authentic definition of Hero, the volunteers are nothing but the secondary characters of each and every Odyssey of those heroes.